Recognizing that Jesus provided for the needs of the guests at the wedding feast at Cana, we join together in prayer grateful for the gift of life and for the richness of the many gifts God has bestowed on us. That the Church may be a consistent and strong voice advocating for the right to life of the unborn, those facing death sentences, those enslaved and abused, and those who are challenged in their daily lives. We pray to the Lord. That caregivers and all people may recognize life as a gift from God and see God’s goodness in the lives of the very young, the disabled, those with dementia, and all people who struggle. We pray to the Lord. That during this poverty awareness month, we may recognize poverty as an assault on the right to life and act compassionately with prayer and action on behalf of those who suffer without basic human needs. We pray to the Lord. That the senseless violence that infects homes, schools, houses of worship, and many places where people gather will not be tolerated and will give way to the universal realization that all human life is to be treasured. We pray to the Lord. That we will be given the grace, wisdom, and insight to recognize the different manifestations of the Spirit distributed individually to each person according to the wishes of the Spirit in all stages of human life. We pray to the Lord. That as Mary interceded with Jesus at the wedding feast in Cana, she will intercede on behalf of all newly married couples and all expecting new births in their lives that they may be good parents and nurture their children well. We pray to the Lord. That grandparents, aunts, uncles, and Godparents will be instruments of God’s love in the raising of the young members of their extended families. We pray to the Lord. That families will cherish the lives of the elderly, nurture them in their declining years, and be aware that, even as it weakens, life is God’s gift that shows his love for all people. We pray to the Lord. That Fr. 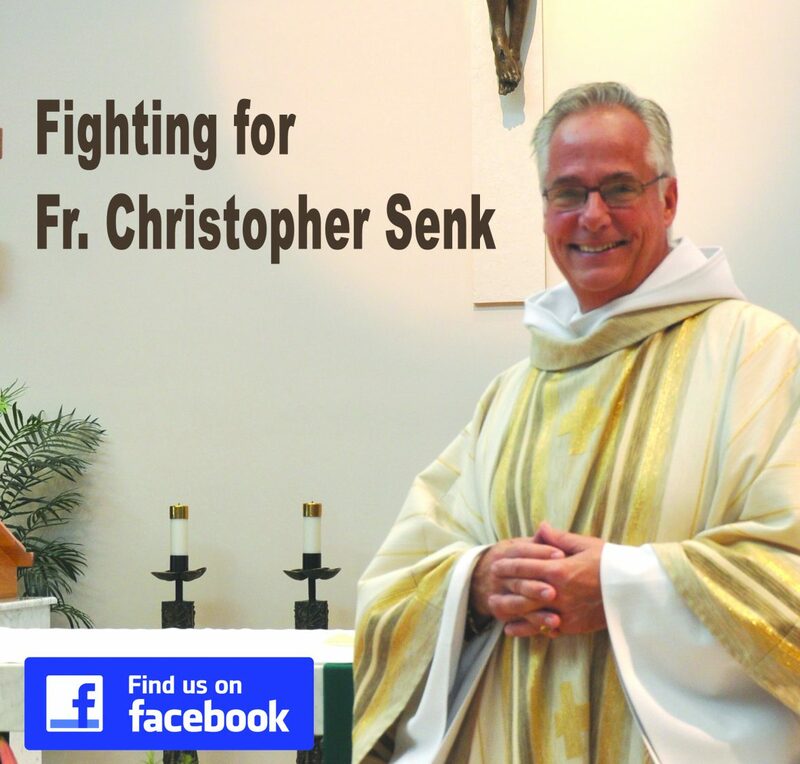 Christopher’s life will be cherished and enriched by those who will not be silent until he is vindicated so that he might be restored as pastor and lead the people entrusted to him through words and actions that support all human life. We pray to the Lord. That those who are fighting serious illness and those who care for them may be thankful for the good things of this life and look forward to the next with hope. We pray to the Lord. That all whose lives have ended may join in celebration, as at Cana, and be received into the eternal feast of heaven. We pray to the Lord. For our own intentions that we recall in silence…….. We pray to the Lord. O God through our petitions, we ask that you conform our minds and hearts to your will for all humanity that you have blessed with the gift of life. We offer each of our lives to you with our prayers that we make through Christ our Lord. Amen. again – thank you for these beautiful reasons to pray and ask and thank God……………. — we hope God doesn’t ask too much of us but we are here for a reason and still needed to be voices and do the actions we are able to do —that just might change someones life for the better! she asked for prayers for her 11th grade grand daughter who is at the ‘march for life’ in Washington this weekend—-every life is important …and we pray for the unborn and those who support all life. Despite our differences in how we view things we were able to have a nice evening of the things we agree on…………. We both love God and are grateful for all He has done for us in our long lives.. we are disappointed in our church and out country as we have aged too but we still love both church and country–and so we pray for both! and I wonder what the definition of ‘CATHOLIC’ is today. We are both Catholics but we see things differently…hmmm- I like my way of thinking and I am sure she likes hers…we remain long time friends however!